Firestone Indy Lights is a storied right of passage for many famous racers including over the years including Helio Castroneves, Tony Kanaan, Dan Wheldon and Greg Moore. More recently, Canadian racing superstar James Hinchcliffe was a graduate of two seasons in the ladder series prior to his IZOD IndyCar Series success. Matthew Di Leo wants to be the next racing Canuck to earn his way into the top levels of motorsport. The 4th place finisher last year in the Cooper Tire USF2000 Powered by Mazda, Di Leo fought against several well-supported organizations with his own team MDL Racing. At 18-years old, the Canadian has already shown the passion, ambition and talent to aspire to much more in motorsports. During the upcoming Honda Indy Toronto race weekend, the driver wants to make his next significant racing stand on home turf. Thanks to a Czech Republic company, the MDL Racing entry has the opportunity to figure prominently in the Firestone Indy Lights competition. Matthew Di Leo's support for the 2013 Honda Indy Toronto event will come from Praga Racing Holding. 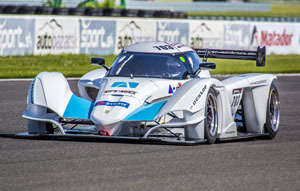 A diverse collection of motorsport companies providing everything from young driver training to professional race vehicles, a Praga racing chassis was part of the 2013 24 Hours of Le Mans race. Praga Director of Media Relations Krystle Carrara stated, "Matthew was one of the first drivers to race on Praga in North America, and he supported and promoted the brand from its inception, so we are happy to return the favor in this collaboration with MDL Racing,". In addition to sponsoring Matthew Di Leo, Praga will have a display of their kart chassis at the 2013 Honda Indy. Starting in ninth place (second-to-last on the grid), Di Leo not only survived his first Firestone Indy Lights race at Long Beach but held on for a strong opening effort. Placing fifth, the Innisfil, Ontario driver is bracing to put on a meaningful demonstration of his talent with the Honda Indy Toronto race weekend. Matthew Di Leo will race July 13th in the eighth round of the 2013 Firestone Indy Lights.